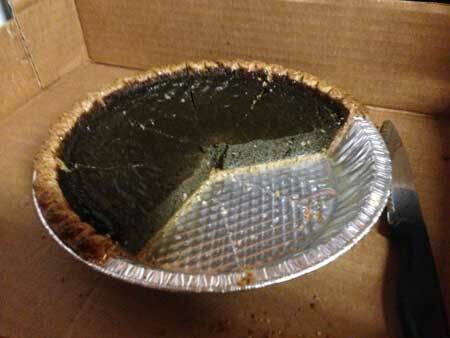 Black sapote pie getting gobbled up by the farm crew. Only crumbs were left. Black sapote is called chocolate pudding fruit because as the fruit ripens, its flesh changes from green to dark brown, like rich chocolate, and develops the consistency of pudding. I suggest calling it mud pie fruit, because your hands get wonderfully messy as you prepare the fruit for eating. The soft pudding-like flesh smears on your fingers as you dig out brown shiny seeds and their membranes, and peel off papery skin before eating. Hands get messy fast! Fun for those who enjoyed making mud pies back in the day — only this “mud” is much tastier. Mmmmm lick those fingers, it’s too good to waste! If you haven’t already gobbled up the fruit from last week’s CSA share, here’s a recipe for a pretty good mud pie made with black sapote. Or you can skip the crust and bake the filling in custard cups, then serve it chilled, with or without whipped cream. The recipe is by Noris Ledesma, but I’ve made a few tweaks (in italics). Feel free to make your own changes to make this your own. Mix sugar, salt and cloves in small dish. Beat eggs in large bowl. Stir in black sapote and sugar/clove mixture. Gradually stir in milk and vanilla. Pour into pie shell. Bake 15 minutes in a preheated 425°F oven; turn temperature down to 350°F and bake about 30 minutes more or until firm. Serve with whipped cream. Farmer Margie Pikarsky recommends Wholly Wholesome organic whole wheat pie shells. I found them at Whole Foods and Publix. Recently I brought a Mud Pie to treat the hard working crew at Bee Heaven Farm. I managed to grab a picture of the pie before it disappeared. We didn’t have whipped cream, but that didn’t take anything away from the experience. One person suggested adding a pinch of allspice, which I’ll try the next time. If you have more black sapote fruit than you need for pie, you can clean and freeze the fruit. It will keep for about 6 months.